The Roadster belonged to the country doctor and the itinerant preacher in days gone by. Famous for its fast trot and ability to go long distances, it was the forerunner of the harness horses you see on the racetrack today. Shown at a jog trot, Road Gait and then at speed, the horses are either hitched to a two-wheeled cart (bike) or a four-wheeled wagon, or shown under saddle. The drivers and riders wear racing silks in farm colors. Roadsters should show animation, brilliance, and competition-ring presence with straight and true action in the jog-trot and Road Gait. "At speed," the horse must show speed and still go in form. The object of the ARHPA is to promote the training and exhibiting of the Roadster horse and pony and to promote and sponsor activities and events that create enthusiasm, use, pleasure, and interest in the Roadster horse and pony. 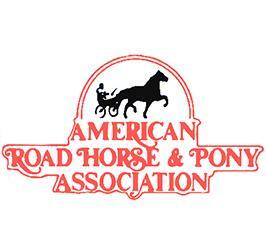 All Roadster Horses competing in licensed competitions must be properly identified and obtain a Roadster Horse Identification number from the American Road Horse and Pony Association.